“Gamification” is a technique of incorporating the game mechanics into the non-game environment. It takes the data-driven techniques that are being used by the game designers for player engagement and applies them to the non-gaming world of websites, application, etc. to motivate participation by the visitor/user. At present, it is transforming the business models by deploying new methods to extend relationships, longer-term engagement with the customers and loyalty with the employees. When it is combined with latest research and big data generated by the user interactions, it could empower businesses. Talking about the user experience – it even enhances usability and simplicity. The introduction of gamification has added self-motivation and ‘fun to use’ approach. Adding some of the game elements to the non-game context have proven to be a method improvising the user experience, simultaneously enhancing engagement and conversion. You might be thinking about how the usage of game elements can improve UX. Let us explore. This is one of the most crucial game elements that would compel or motivate people to take some action. It could prove to be a great tool for improvising UX. In order to enhance the challenge effect, it would be good to add some rewards or points. This would allow users to keep themselves motivated and engaged. Distributing badges or stickers as a reward is very popular. These types of virtual rewards are very popularly used in the video games. These badges or stickers can prove to be additional drivers for motivation. This game mechanic allows user to have an easy interaction with the product. The user could feel like a real player embarking on the journey of product usage. Say for example, on the first page itself, if the introductory features are clearly mentioned or displayed, then users are not liable to make mistake. Further, the method of “scaffolding” can also be used to disclose the features of the product. The method progressively unfolds features so that the user smoothly gains experience in using the features. This approach would help people in avoiding errors, thereby, making it more appealing to use. This game mechanic is used in games, where the user has limited time to finish the game. In the non-gaming world, this technique can be used to keep the users motivated. For instance, they can be offered to do certain things which would be available for limited time. The use of constraints compels people to react faster and take some action. This could help in keeping the user engaged as well as motivated. Further, it could tempt people to explore more on the website.These game mechanics can bring about a noticeable change to the non-gaming world of websites, applications, etc. Also, it would allow the website users to keep themselves engaged. Now let us explore how game elements are helpful in the improvisation of UX. We all love to play games, and it is fun to be engaged in such activity. The games have been the part of human civilization since the very beginning. Most of us are driven by competition, curiosity and a determination to become successful. When the game elements are added to the websites, applications and other non-gaming elements, it makes users enjoy being on the website, application etc. For instance, keep a challenge or problem for the users and let them explore on their own how the problem can be solved. Or you can make use of journey as a game mechanic and tell your users a story, which they would enjoy to read through. When gamification is incorporated into the service or app, it can help businesses keep the user engaged. For this, you can put some activity or task and in turn, give points or rewards on successful completion of the activity or task. This could prove to be a strong motivator and encourage users to continue to the website or app through the tasks or activities. This would also help you in enhancing your site visits, thereby, making an attempt to turn the prospect to your customer. For instance, Nike has released a number of badges that could be earned by the users by simply participating in the activities and challenges offered by Nike Plus Application. Gamification can be used to create a clear path for your users. Let your visitor experience seamless navigation through your website. You can present a story on your website so that your objective becomes clearer and more understandable to your website visitor. For instance, you can create a story involving a hero presenting the objective of your website, what hurdles he has to face and overcome and the rewards that can be expected. Using these game mechanics you can walk your users through a wonderful journey of your product or service. Including gamification in your Business Applications and in UX designs can help you attract more number of visitors to your website. It could significantly enhance your user engagement, thereby, ushering your growth in manifolds. You can even try to create a persona for your website users. 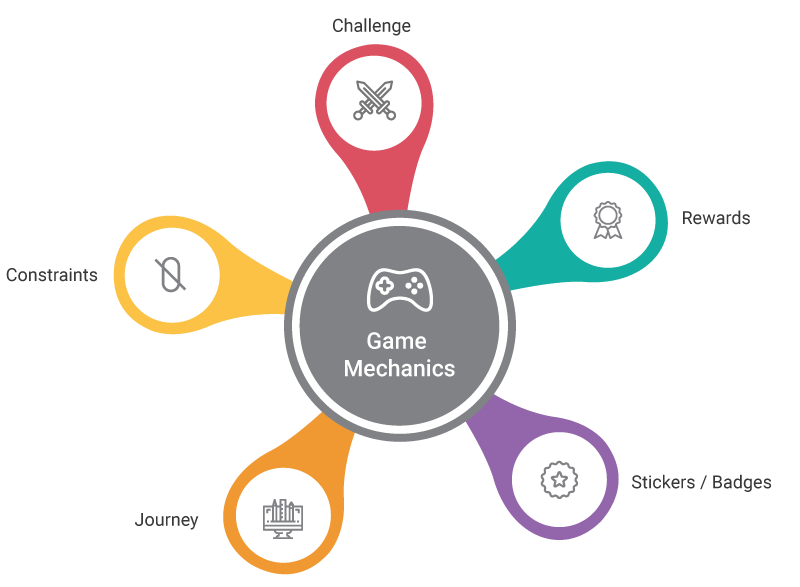 At Multidots we can help you develop applications using gamification. Our skilled task force is capable of providing solutions that can bring about a change in your websites, thereby, helping you grow your business exponentially. If you have used any game elements in your website design or if you are using any of them, share those in the comments below.